The crowdsourced funding craze is picking up steam. Tonight we see the launch of 33needs, a site where socially-minded startups can raise initial seed funding from individual contributors on the Web. It is Kiva meets Kickstarter. Social startups post their “needs” in terms of how much money they are looking to raise, what problems they are going to solve and how they are going to do it, along with a video to help spread the word virally. People can invest $10, $100, $1,000 or more, and in return instead of getting shares in the company, they get a promised percentage of revenues for a specified period of time like 5 percent of revenues for three years. The startups seeking funds are for-profit ventures, as is 33needs. 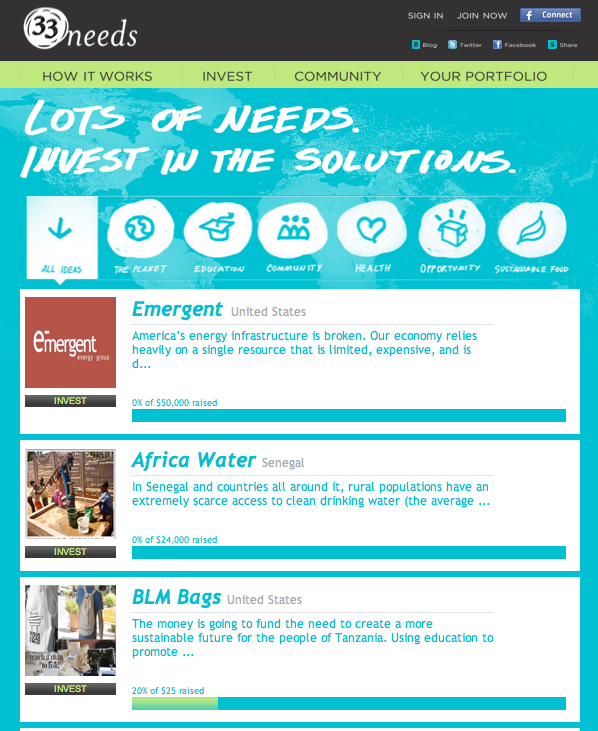 Some of the launch startups include Emergent Energy Group, which wants to bring renewable energy projects to different communities in the U.S., and HalfUnited, a new clothing company which feeds hungry children with part of its profits (see video below). 33needs itself takes a 5 percent cut of any money raised, and nothing if the goal is not met. Generally, thee social startups are trying to raise anywhere from $50,000 or more get their businesses off the ground. They all try to mix profits with creating social good, which increasingly also resonates as a marketing strategy to consumers who want to feel like they are making a difference in the world. Whether or not they actually are is a different matter, but the most enduring social startups will end up being those who create a measurable impact. But using crowdfunding to help start companies, as opposed to microloans for projects (Kickstarter) or people (Kiva), sets a higher bar. These require more money than a simple project. One of the key learnings from Kickstarter, for instance, is that small projects can grow into full-blown startups, but they don’t have to (watch this interview with Kickstarter founder Perry Chen). With 33needs it will be all or nothing. So the startups better make their pitches really good.